Microbial population growth has an optimal temperature characteristic of its type, beyond which the growth not only slows down but can turn into heat inactivation. 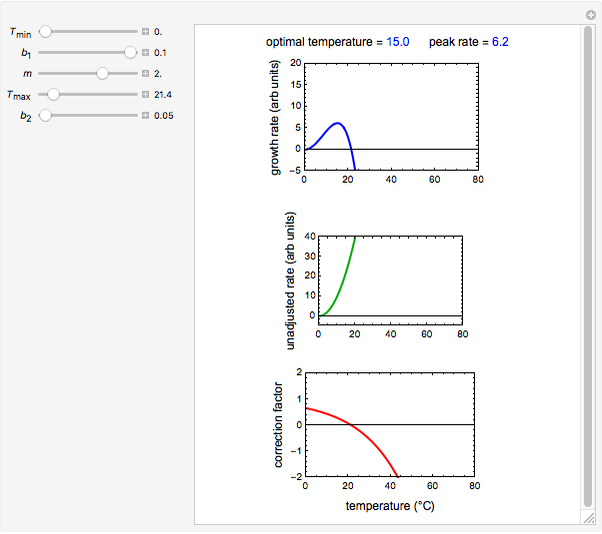 The temperature effect on the growth rate at temperatures well below and above the optimal has been described by several modified versions of Ratkowski's square root model. 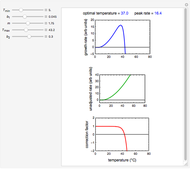 This Demonstration provides graphical visualization of the output for the modified model, and shows plots of the superimposed correction factor. 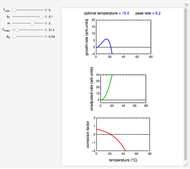 The optimal temperature and peak growth rate can be calculated from the five parameters. where can, but need not always, be equal to 2 [2, 3]. Notice that without the added "If" statement, the original model's equation implies that at , the rate constant rises if , or becomes a complex number if is not an integer. Micro- or macro-organism populations also have an optimal temperature at which their growth rate peaks. At a temperature , usually slightly above it, growth not only ceases but turns into inactivation. In terms of the growth model, at , the growth rate changes sign and becomes negative. where , , , and are the organism's growth characteristics in the particular medium or habitat. 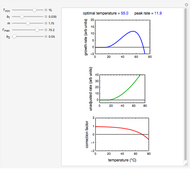 This Demonstration simulates growth rate versus temperature curves from their initiation at a low temperature to the inactivation regime using the expanded version of the modified Ratkowski's model for graphical visualization, with its parameters , , , and entered with sliders. 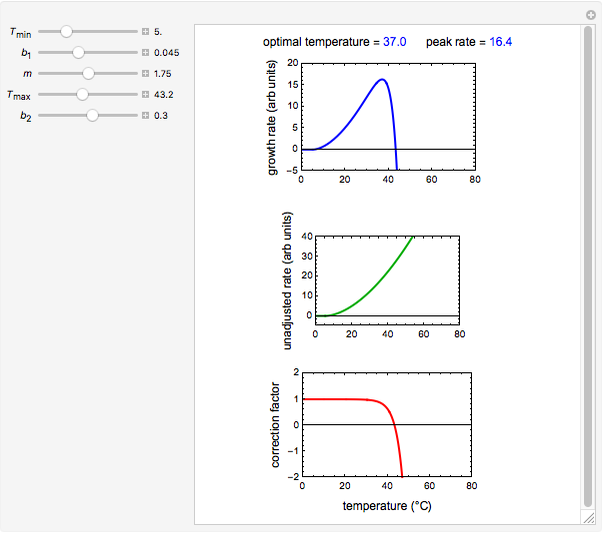 It also shows the correction factor as a function of temperature, and displays the optimal temperature and corresponding peak growth rate calculated for the chosen parameter combination using the FindRoot function. 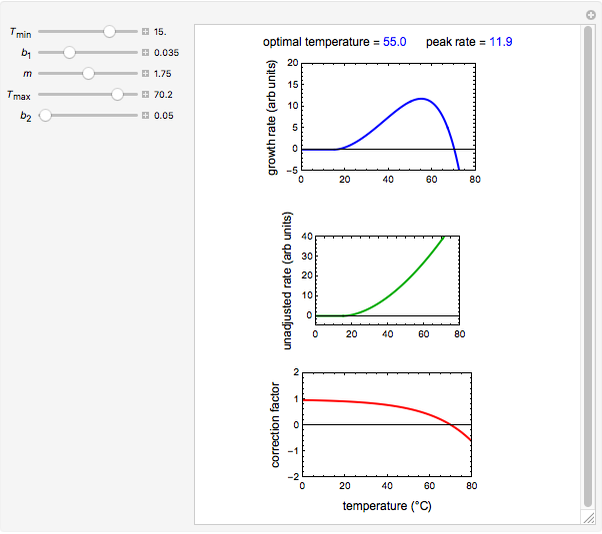 The purpose of this Demonstration is only to illustrate the features of the modified Ratkowski model, not to match the behavior of any particular micro- or macro-organism. Therefore, not all the parameter combinations allowed by the controls necessarily represent real-life growth/inactivation scenarios. Also, the Demonstration solely addresses the growth rate, however defined or determined, disregarding the potential effect of temperature on other growth parameters, notably the asymptotic growth level, and time to reach the inflection point . D. A. Ratkowski, R. K. Lowry, T. A. McMeekin, A. N. Stokes and R. E. Chandler, "Model for Bacterial Culture Growth Rate throughout the Entire Biokinetic Temperature Range," Journal of Bacteriology, 154(3), 1983 pp. 1222–1226. M. H. Zwietering, J. T. de Koos, B. E. Hasenack, J. C. de Wit and K. van't Riet, "Modeling of Bacterial Growth as a Function of Temperature," Applied and Environmental Microbiology, 57(4), 1991 pp. 1094–1101. Mark D. Normand and Micha Peleg "Ratkowski's Square Root Growth Rate Model for High Temperatures"